Description: Located between two middle sized town and in the center of very well appointed village. 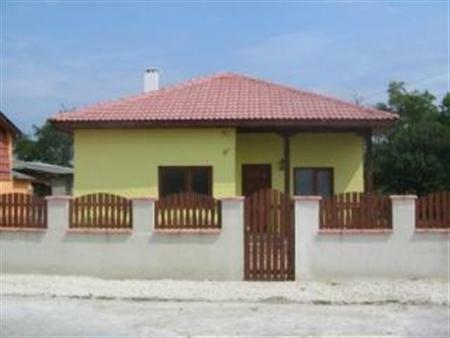 Situated in a village just - 15km far from the sea cost and 60km from Varna International Airport. The village stands near Balchik town close enough for you to go shopping there. Furthermore the popular tourist centre of Albena is just 30 km away. The village offers several food stores, a pub, city hall, doctor, bakery, park, etc. The house comprising: spacious living room, fitted kitchen with appliances, 2 bedrooms, bathroom with WC, verandah, outside BBQ area. The house is fully furnished and ready to move-in. The Yard offers enough space for building of additional amenities such as a swimming pool, etc. Connected to the property is mains water, electricity, septic tank, with telephone and ADSL Internet available. There is convenient bus transport. It is accessible the whole year by asphalt road. The village is well arranged offering blue skies and clean air. Great Investment & Holiday Property!